Communities of species previously unknown to science, a lost world of wildlife, have been discovered on the seafloor near Antarctica, clustered in the hot, dark environment surrounding hydrothermal vents. The discoveries, made by teams led by the University of Oxford, University of Southampton, the National Oceanography Centre, and British Antarctic Survey, include new species of yeti crab, starfish, barnacles, and sea anemones, and even an octopus probably new to science. For the first time researchers, using a Remotely Operated Vehicle (ROV), have been able to explore the East Scotia Ridge deep beneath the Southern Ocean where hydrothermal vents, including ‘black smokers’ reaching temperatures of up to 382 degrees Celsius, create a unique environment lacking sunlight but rich in certain chemicals. The team report their findings in this week’s PLoS Biology. Highlights from the ROV dives include images showing huge colonies of the new species of yeti crab, thought to dominate the Antarctic vent ecosystem, clustered around vent chimneys. 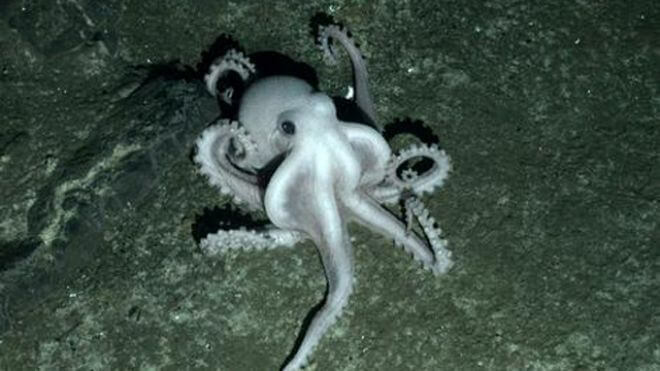 Elsewhere the ROV spotted numbers of an undescribed predatory seastar with seven arms crawling across fields of stalked barnacles and found an unidentified pale octopus nearly 2,400 metres down on the seafloor. The team believe that the differences between the groups of animals found around the Antarctic vents and those found around vents elsewhere suggest that the Southern Ocean may act as a barrier to some vent animals. The unique species of the East Scotia Ridge also suggest that, globally, vent ecosystems may be much more diverse, and their interactions more complex, than previously thought. In April Professor Rogers was part of an international panel of marine scientists who gathered at Somerville College, Oxford to consider the latest research on the world’s oceans. A preliminary report from the panel in June warned that the world’s oceans are at risk of entering a phase of extinction of marine species unprecedented in human history. ROV dives were conducted with the help of the crews of RRS James Cook and RRS James Clark Ross. The discoveries were made as part of a consortium project with partners from the University of Oxford, University of Southampton, University of Bristol, Newcastle University, British Antarctic Survey, National Oceanography Centre, and Woods Hole Oceanographic Institution supported by the UK’s Natural Environment Research Council (NERC) and the US National Science Foundation (NSF). A report of the research, entitled ‘The discovery of new deep-sea hydrothermal vent communities in the Southern Ocean and implications for biogeography’, is published this week in PLoS Biology.